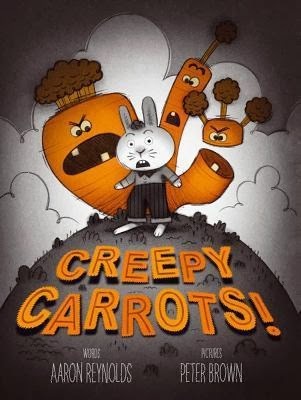 Creepy Carrots! by Aaron Reynolds, illustrated by Peter Brown (Simon & Schuster Books for Young Readers, 2012). I wanted to share something slightly scary, but not really Halloween-y and this fit the bill nicely. The ending is a funny twist and the color scheme really adds to the creepy atmosphere of the story. Shark in the Park! by Nick Sharratt (Corgi Childrens, 2000). 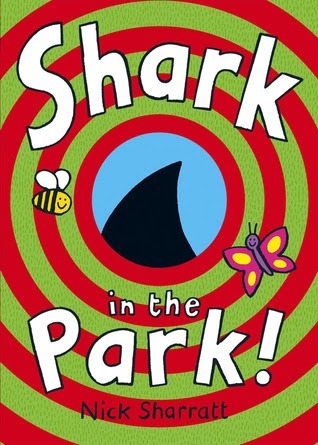 Timothy Pope goes to the park with his telescope and keeps thinking he sees a shark at the park... but does he? While reading this one, I have the kids make telescopes with their hands and look up, down, and all around with me. 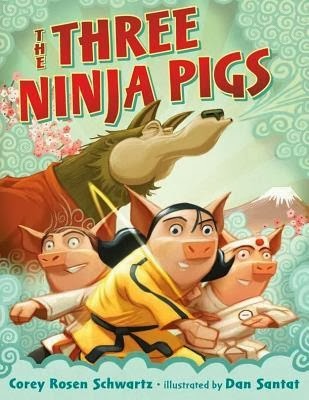 The Three Ninja Pigs by Corey Rosen Schwartz, illustrated by Dan Santat (Putnam Juvenile, 2012). This martial arts twist on The Three Little Pigs is definitely a crowd-pleaser. The rhyming text makes it a fun read and the martial arts details hold the interest of the kids. They asked me to read this one again, which NEVER happens with this group! For this month's craft, we did leaf rubbings, which I love because it is so cheap and easy. And if the kids enjoy it (which all of our kids did), they can very easily do it again at home or with their Afterschool group. Any new favorites for the school-age set?